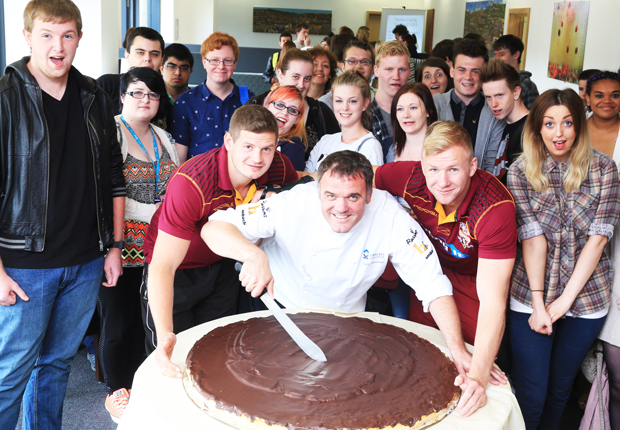 Star players from rugby league club the Huddersfield Giants tackled a giant jaffa cake at Kirklees College. Catering and hospitality curriculum team leader Gary Schofield spent five hours baking the 16kg cake. It consisted of 50 eggs, 2.5kg of flour, 2.5kg of margarine, 2.5kg of sugar and 5kg of dark chocolate, and a generous helping of orange jelly. Huddersfield Giants winger Aaron Murphy and prop Jacob Fairbank gave out awards and were given slices, along with more than 60 level one, two and three catering and hospitality students, at a ceremony celebrating the achievements of learners. Mr Schofield said: “Making the jaffa cake was something we thought of for a bit of fun to celebrate the students’ achievements over the year.